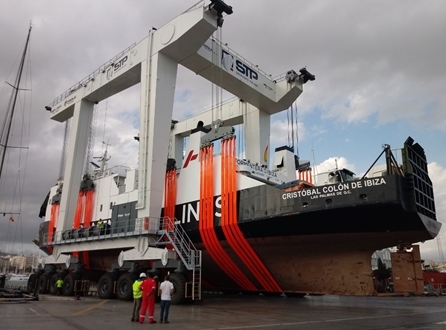 Europe’s largest travelift, with a hoisting capacity up to 1000tn, has been tested at STP Shipyard Palma’s facilities, and it is now ready to operate. This new travelift will allow the yard to lift significantly larger yachts, who previously have had to go elsewhere for repair and refit work if they needed to be ashore. For security reasons, STP wanted to perform several tests before operating with its clients. The first test was carried out with a 46 mtr sailing yacht. With this test, the travelift staff got to know the movement capacity of this new travelift. They found it much more agile than the current 700 ton version. This superior manoeuverability is thanks to its 32 wheels with electronic direction control and two Volvo 286Hp engines. The 32 slings and 4 hoists -1 fixed and 2 mobile- per side provide more versatility when hoisting the yacht, offering major mobility to suit them to the yacht’s dimensions. One of the tests before its premiere, was performed last Sunday with the ferry Cristobal Colón from Ibiza, property of Formentera Lines. The vessel, with 56m in length and 12 meters beam was firstly hoisted without extra load. Subsequently, a total of 8 trucks were introduced into the vessel to increase the lifting tonnage. With this weight the dynamic test was carried out, consisting of maneuvering the travel lift in the shipyard, demonstrating its agility. Later the static test was carried out, where the new travelift hoisted the Christopher Columbus of Ibiza with the 8 trucks and additional ballast that made it reach its maximum weight capacity. Once the capacity had been shown, and the skill of the professional team that handles it, the "1,000 tons" continued making tests, hoisting a 500 ton yacht to make other adjustments. It was a 56.4 mtr sailing yacht that could not have been lifted previously. For several years, the nautical sector has experienced an important growth, especially in the Balearics. There are several conditions that favour this situation, such as the weather, the location and the growing offer of quality specialists in the different refit areas of vessels. It is for this reason that, STP Shipyard Palma, is committed to grow to meet the needs of the market, offering better equipment to provide service and response to the increasing demand of larger yachts that choose Mallorcaas the place to perform their maintenance and repair work.